On February 18th, 2019 the centaur planet Chiron will move into the sign Aries where it will travel through 2027. As astrological symbols, Chiron represents the journey from suffering to spiritual awakening, and Aries expresses the individual ego and mind. During this 9-year transit, we’ll learn about the ways we create and perpetuate our own pain through ego battles and self-centeredness, and will develop skills for healing the root causes and implications of self-inflicted afflictions in ourselves, others and the world we share. This workshop is offered live and online via video conference. The online class takes place on Saturday, April 6th from 11AM-1:30PM Pacific Time. Participants will be sent PDF handouts. IT IS NOT NECESSARY TO JOIN THE VIDEO CONFERENCE if it conflicts with your schedule or other needs. The workshop will be recorded and available for download as of April 8th. Requirements: In order to participate in this course, it’s helpful if you know the exact time of your birth. If you don’t know the time you were born you can still participate, though the information may be slightly less specific. I don’t need your birth details, but please prepare for the course by visiting astro.com and creating a free birth chart. You will need to know your ascendant (AC), or rising sign. If you don’t know your birth time you will need to know your sun sign. Delivery: A pre-order confirmation will be emailed to you immediately upon purchase. This confirmation is a PDF with the basic course details. It is not the course or the link to it. A link to the video conference will be emailed to you by April 4, 10PM Pacific Time. If you do not receive a pre-order confirmation, or a link to the course by April 5, please contact me. For those who will not attend the live video conference, a link and instructions for accessing the online class will be sent by Monday, April 8, 12PM Pacific Time. Format: This course will be offered first through a live conference call via Zoom, and participants will be sent the course handout via email. The class recording and handouts will be available as an online class, accessible through my website on a password protected page. Videos will be available for download or can be streamed. The password and instructions will be sent to you by email. If you pre-order the class you will be able to access it by April 8th. If you purchase the class after April 8th, it will be available immediately. Send this class as a gift! Just order using your own information. When you get the email with the course link, forward it to the gift recipient along with your personal message. Please do not click the access link, as your purchase only admits one course per participant. On March 6th, 2019 the planet Uranus will enter the sign Taurus where it will travel through 2026. As an astrological symbol, Uranus represents extreme change and chaos, upheaval, breakdowns and breakthroughs, innovation and awakening. Its function is to liberate us from the confines of normativity and push us into the next steps of evolutionary necessity. Taurus, as a sign, is closely associated with earth, resources, value, wealth and materiality. Its symbol represents the ways we sustain and accumulate, build our sense of self-worth, and contribute to the world through developing our value(s). With an 84-year orbit, the last time Uranus was in Taurus was 1934-1942. As we move into this new cycle we’ll be revisiting and redefining our understanding of changing economies and economic upheaval, labor, and the human and environmental impact of industrialization. 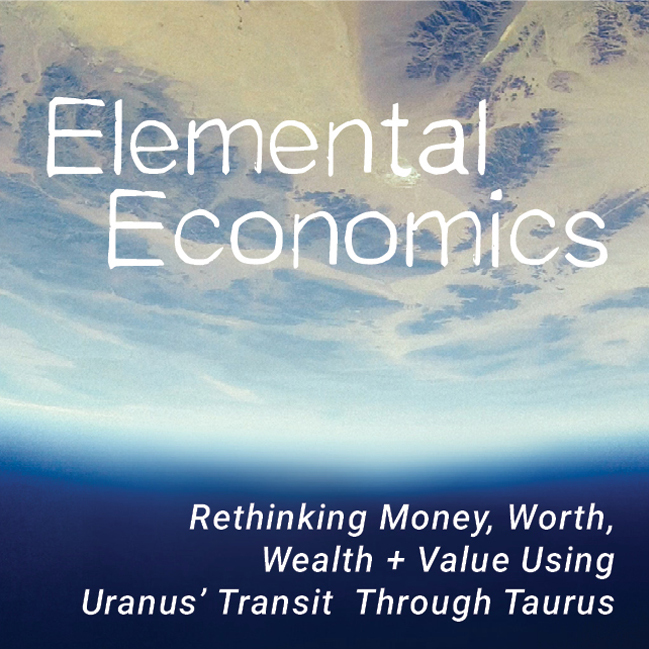 With the potential to significantly alter our relationships to money and finance, this transit brings with it the opportunity to shift into a new economic paradigm and redefine value for ourselves and in our shared communities. A guide to key dates and transits of Uranus in Taurus. This workshop is offered live and online via video conference. The online class will take place on Saturday, May 4th from 3:30-6PM Pacific Time. Participants will be sent PDF handouts. IT IS NOT NECESSARY TO JOIN THE VIDEO CONFERENCE if it conflicts with your schedule or other needs. The workshop will be recorded and available for download as of May 6th. Delivery: A pre-order confirmation will be emailed to you immediately upon purchase. This confirmation is a PDF with the basic course details. It is not the course or the link to it. A link to the video conference will be emailed to you by Thursday May 2nd, 10PM Pacific Time. If you do not receive a pre-order confirmation, or a link to the course by May 3rd, please contact me. For those who will not attend the live video conference, a link and instructions for accessing the online class will be sent by Monday, May 6th, 12PM Pacific Time. The class recording and handouts will be available as an online class, accessible through my website on a password protected page. Videos will be available for download or can be streamed. The password and instructions will be sent to you by email. If you pre-order the class you will be able to access it by May 6th. If you purchase the class after May 6th, it will be available immediately. IF YOU’D LIKE TO OFFER A BARTER INSTEAD OF $$, PLEASE CONTACT ME WITH YOUR OFFER! 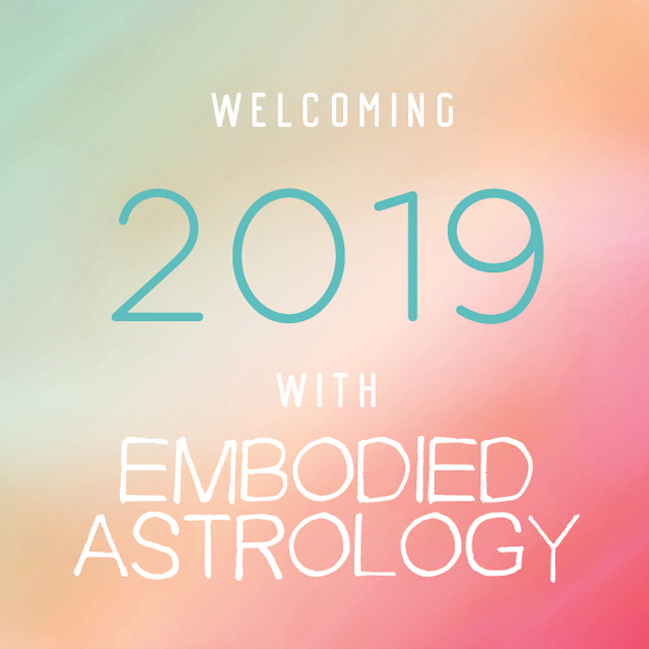 Join me for an experiential and experimental journey into the near future where I’ll provide you with clear, fun and accessible means for understanding the esoteric and symbolic language of astrology. This class will give you a basic map for the next 12 months of upcoming opportunity periods, potential challenges and best practices to help you take advantage of this year’s astrological weather. In the course packet you’ll receive a thorough handout that includes tools for reading and applying the current astrology to any natal chart. Included in the course packet are legends for planetary transits through the signs, rubrics for understanding how each planet will affect an individual’s chart based on their rising sign, calendars for the retrograde cycles and eclipses, plus a 2019 lunar cycle yearly calendar. How to read planets, signs and houses, and apply the presented astrology to your own natal chart. How the planets and signs work through your body, environments and relationships – and how to work with these energies and events through embodied awareness, breath, creativity and intention. Beginners and more experienced astrologers alike will enjoy this unique approach to astrology that blends meditative and somatic practices with personal, political and spiritual reflection. No previous knowledge or experience with astrology is required.